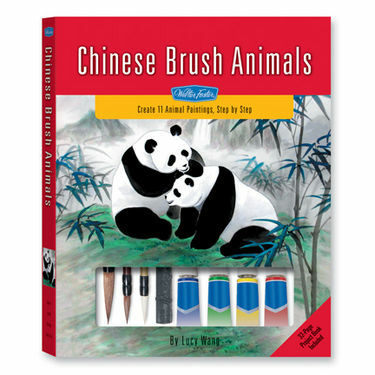 This captivating kit pairs the art of Chinese brush painting with a favorite drawing subject—animals! This convenient, carryall kit contains all the tools and materials beginners need to begin exploring the ancient artistic tradition of Chinese brush painting. Not only will you find instruction on how to effectively use the tools of the trade, you’ll also discover a series of step-by-step lessons you can follow along with to create your own beautiful animal paintings. With the help of Lucy Wang’s step-by-step, easy-to-follow instructions and inspiring finished paintings, you will be creating your own Chinese brush masterpieces in no time! Hardcover 9" x 11.25" case includes 32-page paperback book, ink stick, ink stone, brush rest, 3 Chinese paintbrushes, ceramic palette, 8 watercolor paints, and watercolor paper.